Crowns and bridges are fixed dental prosthesis, meaning that they are cemented into place and cannot be removed. Crowns are primarily used to protect teeth that have become damaged as a result of trauma or decay, while bridges are used to replace one or more missing teeth. Crowns are composed of a single “cap” that is cemented over a damaged tooth, while bridges are composed of a series of crowns. Bridges are cemented to the remaining teeth and span over the spaces left by missing teeth. Temporary: made of an acrylic-based material or stainless steel, these crowns are only worn while the dental lab produces your permanent crown. Depending on the type of dental crown you decide on, you may or may not get a temporary crown to wear. All ceramic or all porcelain: composed entirely of a ceramic material or porcelain, these crowns provide the most visually appealing look that can even be matched to your existing teeth color. They are also an ideal dental crown option if you have a metal allergy. 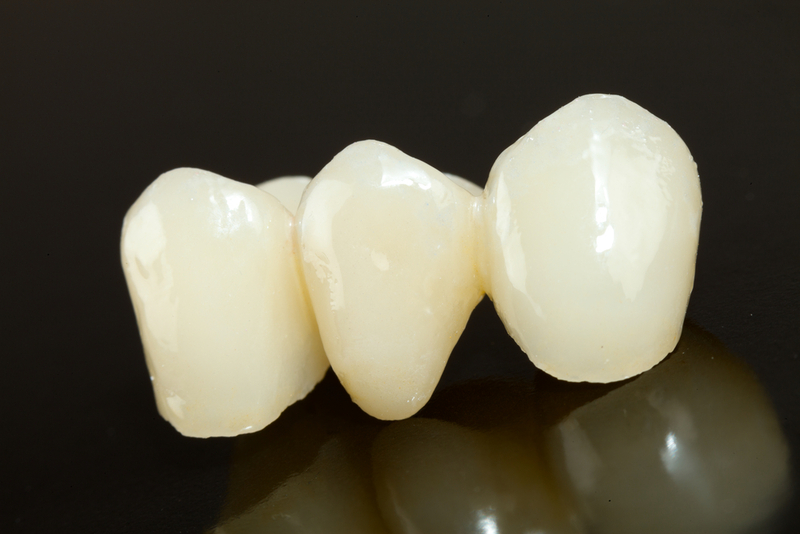 All-resin: one of the most affordable crown options available. However, resin crowns tend to be more prone to fracturing than other types of dental crowns and may need to be replaced more frequently. Porcelain fused to metal: a metal shell that uses an porcelain coating, these dental crowns are popular for their durability and appearance. However, the opposing teeth may wear down faster than usual. Also, the porcelain can sometimes chip and the metal can sometimes show through the porcelain. 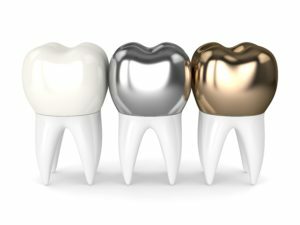 Metal: dental crowns that are made from gold, platinum, and base-metal alloys like cobalt-chromium and nickel-chromium. Metal dental crowns are highly resistance to chips, and can last a long time. However, since they have a metallic appearance, they are generally only used in the back teeth. Traditional Bridge: crowns placed on the teeth adjacent to the missing tooth with a pontic, or artificial tooth, in between them. This is the most commonly used type of dental bridge. Maryland Bonded Bridge: uses crowns made from porcelain, porcelain fused to metal, or plastic teeth and gums, coupled with a metal framework for additional support. Often times, this type of bridge is only bonded to one side of the missing tooth. Cantilever Bridge: a dental bridge that is used when only one side of adjacent teeth is present. However, this type of bridge is rarely used and is not recommended for use in the rear of the mouth. Dental crowns and bridges can help to restore your speaking and chewing functions. Although it may take some time to adjust to your dental crown or bridge, they will eventually make eating easier and will improve your speech. How do I know if I need dental crown or bridge? A dental crown or bridge may be beneficial for you if you have teeth that are damaged because of past trauma or decay, or if you have missing teeth. To find out for sure if you need a dental crown or bridge, and which option is the most ideal for your case, schedule a consultation with Fedorciw, Massoumi, & Kolbig today. What can I expect when getting a crown or bridge? In order to get a crown or bridge, your teeth will need to be first shaped to fit a crown or bridge. Once your teeth are properly shaped, an impression will be taken and used to fabricate your custom crown or bridge. While you wait for the permanent restoration, you will be fit with a temporary crown or bridge to wear. Once the final restoration comes in, it will be cemented to your teeth and the procedure is complete. What can I expect after getting a crown or bridge? After getting a crown or bridge placed, your teeth may experience a brief period of sensitivity until they have a chance to fully heal. You may also notice that your gums are sore. Both the sore gums and sensitivity will fade within a few days and can be easily managed with over the counter pain medications if needed. How do I take care of my crown or bridge? Dental crowns and bridges must be taken care of like your natural teeth. That means they need to be brushed twice a day and flossed once a day. You also need to visit Fedorciw, Massoumi, & Kolbig twice a year for your dental check up and professional cleaning. 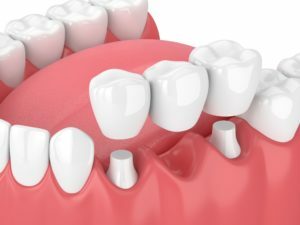 How long will my dental crown or bridge last? Dental crowns and dental bridges will generally last between 5 and 15 years. To maximize their lifespan, you will want to maintain good oral hygiene and avoid damaging behaviors such as teeth grinding, chewing ice, biting fingernails, or using your teeth as openers. How much do dental crowns or bridges cost? The cost of your dental crowns and bridges will depend on type of material used and the number of teeth being treated. A ballpark figure for dental crowns is approximately $800-$1700 per crown. However, if you have dental insurance, you may be able to receive partial coverage for your procedure. If you would like to experience the difference crowns & bridges can make for your smile, call our office today and schedule a consultation! Fedorciw, Massoumi & Kolbig are happy to serve patients in Cromwell, Middletown, Rocky Hill and other surrounding areas in Middlesex County (including Berlin).